"We’re having the wrong discussion about foreign policy"
New York Times columnist Paul Krugman began his piece yesterday by pointing out that on both Wednesday and Thursday, the price of oil briefly hit $100 a barrel. What are the implications of that, beyond the effect that having that price stick might have? Krugman says, that among other things, as this 2008 presidential campaign is unfolding, "we’re having the wrong discussion about foreign policy." Almost all the foreign policy talk in this presidential campaign has been motivated, one way or another, by 9/11 and the war in Iraq. Yet it’s a very good bet that the biggest foreign policy issues for the next president will involve the Far East rather than the Middle East. In particular, the crucial questions are likely to involve the consequences of China’s economic growth. Turn to any of several major concerns now facing America, and in each case it’s startling how large a role China plays. Start with the soaring price of oil. Unlike the oil crises that followed the Yom Kippur War and the overthrow of the shah of Iran, this crisis wasn’t caused by events in the Middle East that disrupted world oil supply. Instead, it had its roots in Asia. It’s true that the global supply of oil has been growing sluggishly, mainly because the world is, bit by bit, running out of the stuff: big oil discoveries have become rare, and when oil is found, it’s harder to get at. But the reason oil supply hasn’t been able to keep up with demand is surging oil consumption in newly industrializing economies — above all, in China. Even now, China accounts for about only 9 percent of the world’s demand for oil. But because China’s oil demand has been rising along with its economy, in recent years China has been responsible for about a third of the growth in world oil consumption. As a result, oil at $100 a barrel is, in large part, a made-in-China phenomenon. Krugman's argument is, I believe, right on target. We have to have a rational discussion about how we deal with China's economic growth, which finds the nation absorbing increasing amounts of global resources, all the while its government represses millions and menaces others. For some time, I have been arguing that over the long haul, China is a greater threat to the peace and security of the United States--and of the world, particularly of Asia--than the radical jihadists. The jihadists, like all violent fringe groups will, eventually, burn themselves out, wear out their welcomes, or be co-opted. This doesn't mean that the US and the rest of the civilized world shouldn't deal with these thugs. But their movement simply doesn't have historical "legs." China--or, more accurately, the government of China--poses a more long term and a much bigger threat than the jihadists. This is true even if the intentions of the government in Beijing are as benign as Krugman apparently believes them to be, that their only interest is in economic growth. Krugman apparently ascribes no malevolence to the regime there. To take such a view means, I believe, overlooking the alarming growth of the Chinese military, the continued commitment of the government to repressing any movement toward democracy, and the continued menacing rhetoric regarding Taiwan. The Beijing government, I believe, is trying to use the country's remarkable economic growth to buy off a nation starved for the stuff of Western prosperity, gaining the population's acceptance of repression in exchange for HDTVs and cars. Whatever Beijing's intentions, the country's growth, often at the expense of the environment, the safety of its products, and the economy of countries like the United States, poses a huge threat to this nation's economic and military security. It deserves to be discussed in the presidential campaign. For more on the Chinese government's threat to the peace and security of the US and the world, go here, here, here, here, here, here, here, here, and here. During my first visit with Edith about a month-and-a-half ago at the Logan Health Care center, I asked her, as I often ask nursing home residents, how she liked living there. Her answer came in an instant. She liked it very much, she told me. Now, I have to tell you that I don’t always get an answer like that. Moving into a nursing home after a lifetime of independence is a bitter pill to swallow for anyone. Rare is the person who can look past those feelings to accept the necessity of their new living situation. But Edie did accept it. As if to confirm that, a short time later, as I was preparing to share Holy Communion with her, Edith said, “There’s a man in the next room who likes to take Communion when I do. Would that be okay?” That was more than okay with me. So, Hubert came to Edie’s room and received Holy Communion at the same time. Part of the reason that Edith adjusted so well to life in a nursing home, then, is that she was willing to do the work necessary to create a kind of family with the other residents and the staff at Logan Health Care. This is remarkable, when you think about it. Edith after all, was already part of a family. And, boy, did she love that family! During that first visit I had with her and almost every time I visited with her in the hospital, Edie spoke with me about her sons, Chuck and Robert and their wives, Eva and Kay. She never failed to mention that she loved them and was proud of them. What this tells me is not only that her family was important to Edith, but also that her family included more than just those related to her. I get this same sense about Edith when I talk with people at Saint Matthew. And I can tell you that to them, Edie was more than just a name on the church roster. She was a beloved member of our Christian family! In short, Edith seemed to know how to love, to make people feel valued and included. That is a special gift, one which, by all accounts, she exhibited with good humor. This gift, in fact, cuts to the very heart of what it means to be a follower of Jesus Christ. Jesus, you remember, was once asked what the greatest commandment from God is. Jesus, summarizing all the laws found in the Old Testament, said, “'You shall love the Lord your God with all your heart, and with all your soul, and with all your mind'...And a second is like it: ‘You shall love your neighbor as yourself.’"
All of God’s laws and the words of all the prophets, Jesus goes on to say, are built on these two commands. God our Father wants His family, the entire human race, to be held together by the strong bonds of love made available to us through Jesus Christ. But, let’s face it, it’s not often that you and I see people who exhibit the capacity to love in this way, to treat so many as though they are part of “one big family,” the way Edith did. If she could be with us right now, I suspect that Edith would tell us the source of her capacity to live so differently, to love so expansively didn't come from inside of her. God loved us before we were even born. He died on a cross for us and rose from the dead for us before were ever knew that we needed a Savior. Edith believed in this Savior, she trusted Him with her life. It was Jesus Christ Who gave her her remarkable capacity to love! Deep inside of us all, we want to love others as God first loved us through Jesus Christ. We want others to get a sense of the love that changed our lives forever when God sent His only Son so that whoever believes in Him will never perish, but have everlasting life. Edie, it seems to me from meeting her and talking with those who knew her, went beyond wanting to live like that to actually, very often, living like that. As you grieve your loss, dear family and friends, the greatest memorial you can erect in Edith's honor is to follow the Savior she followed and to remember that through Jesus Christ, Who loved you from a cross and an empty tomb, you get to love. You get to treat others as though they were part of one big family. I think that Edith would like it if you lived like that! On the first weekend of every month, Logan Town Center, the organization working to revitalize Logan, Ohio's historic downtown business district, sponsors special weekend activities. This weekend, the Ice Extravaganza is happening. 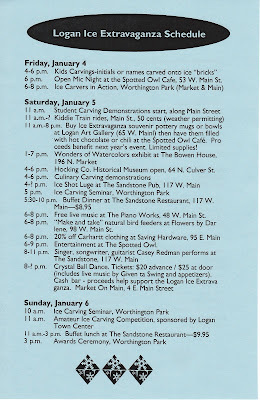 If you're going to be anywhere southeastern Ohio this weekend, come and spend time in downtown Logan. Click on the image above to see the complete schedule. From my brief acquaintance with Arthur, I’ve learned that he knew a thing or two about what it meant to be a good shepherd. In fact, I’m told that that was at least one person’s nickname for him. Of course, that moniker was given to him more for the kind of man he was than the sort of shepherd he was, though I have no doubt that he did his work well. I met Arthur on November 21, little more than a month ago. But in the short time since, I’ve learned that he was a gentleman, in the fullest sense of that term. He was also a person who loved his family. Before I left his house that day in November, he had his daughter-in-law Sheila take me into his living room, so that he could show pictures of his family to me. Like the good shepherd in Jesus’ parable in Luke 15, Arthur cared about and counted all his sheep. Each member of his family was irreplaceably important to him! Arthur was also a fun man, with a quick smile and a sense of humor that was with him until the end. He enjoyed cards. He liked to dance. He relished having get-togethers with family and friends. And, of course, he loved the farm life. Arthur, I’m told, was not the sort of man to talk much about his faith. But if anyone was heaven-bound, it was Arthur. And, I’m sure that he would tell you, it wasn’t because he was better than others. It was because Arthur knew and followed the Shepherd, the Good Shepherd, Jesus Christ. There was an earnestness in Arthur’s praying, in the way he received the Sacrament, and in the warmth with which he thanked you for prayers or for the Bread and Wine that told you who his Good Shepherd was. As he endured the pain and trials of his final illness, you could see that here was a man who was depending on the God we know in Jesus Christ to be the shepherd who would lead him through the darkest valleys of life and death, on to the everlasting light of life with God! Arthur was ninety-five years old, just two months shy of ninety-six. You members of his family know that this is an extraordinary age and that the past two years, in particular, have been a gift. But it would be unnatural for you not to grieve. And you will grieve. Death, at least as it relates to our lives on earth, breaks ties of love and cherished habits. The longer a loved one has been in our lives, the stronger the love and the habits are. So, don’t feel that your grief is on a clock or that it’s illegitimate. Your grief is understandable. But I know that Arthur would tell you that the way through your grief and beyond is Jesus Christ. Jesus describes Himself as the Good Shepherd and tells us, “The sheep hear his voice. He calls his own sheep by name and leads them out.” That was what the Lord Jesus did with Arthur on Saturday. He called and led Arthur through death to everlasting life with God. Arthur, I believe, is in green pastures with all who have trusted in Jesus as their Lord. But, as Psalm 23 points out, Jesus isn’t just the shepherd of the ends of our days. He can be our shepherd now. I used to think that when the Psalm spoke of “the darkest valley” or, in older translations of “the valley of the shadow of death,” it was only speaking of death itself. Or, of our encounters with death at the ends of our days. Yet, in many ways, death shadows us all through our entire lives. But no matter what valley we walk through, our Shepherd, the One Who died and rose for us, is with us, giving us strength and hope and the courage and joy to live each day to the full, knowing that we are among His sheep for all eternity! We’ve just celebrated Christmas, the day when the Light of the world crashed through our darkness to give us a hope that never dies. The Bible says of Jesus that “the Light shines in the darkness and the darkness has not overcome it.” As you face your earthly futures without the gentle presence of Arthur in your lives, keep following the Good Shepherd. He will light your way and fill you with the same strength you saw in Arthur. And the same future with our loving God he’s enjoying now. I don't know what Emmanuel Mwambulukutu's religion is, but the Tanzanian government's representative is a profile in courage, grace under fire. An update on his condition is here. God grant to all readers of Better Living a good new year! And may the Buckeyes win a national championship in football!